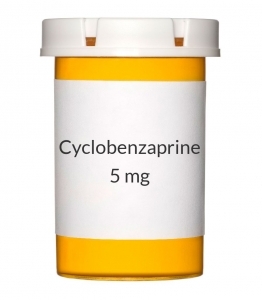 USES: Cyclobenzaprine is used short-term to treat muscle spasms. It is usually used along with rest and physical therapy. It works by helping to relax the muscles. HOW TO USE: Take this medication by mouth with or without food as directed by your doctor, usually 3 times a day. The dosage is based on your medical condition and response to treatment. This medication should only be used short-term (for 3 weeks or less) unless directed by your doctor. Do not increase your dose or use this drug more often or for longer than prescribed. Your condition will not improve any faster, and your risk of side effects will increase. Tell your doctor if your condition persists after 2 to 3 weeks or if it worsens. SIDE EFFECTS: Drowsiness, dizziness, dry mouth, or tiredness may occur. If any of these effects persist or worsen, tell your doctor or pharmacist promptly. Remember that your doctor has prescribed this medication because he or she has judged that the benefit to you is greater than the risk of side effects. Many people using this medication do not have serious side effects. Tell your doctor right away if you have any serious side effects, including: fast/irregular heartbeat, mental/mood changes (such as confusion, hallucinations). A very serious allergic reaction to this drug is rare. However, get medical help right away if you notice any symptoms of a serious allergic reaction, including: rash, itching/swelling (especially of the face/tongue/throat), severe dizziness, trouble breathing. This is not a complete list of possible side effects. If you notice other effects not listed above, contact your doctor or pharmacist. In the US - Call your doctor for medical advice about side effects. You may report side effects to FDA at 1-800-FDA-1088. In Canada - Call your doctor for medical advice about side effects. You may report side effects to Health Canada at 1-866-234-2345. PRECAUTIONS: Before taking cyclobenzaprine, tell your doctor or pharmacist if you are allergic to it; or if you have any other allergies. This product may contain inactive ingredients, which can cause allergic reactions or other problems. Talk to your pharmacist for more details. Before using this medication, tell your doctor or pharmacist your medical history, especially of: liver disease, overactive thyroid (hyperthyroidism), heart problems (such as irregular heartbeat, heart block, heart failure, recent heart attack), difficulty urinating (such as due to an enlarged prostate), glaucoma. This drug may make you dizzy or drowsy. Do not drive, use machinery, or do any activity that requires alertness until you are sure you can perform such activities safely. Avoid alcoholic beverages. Before having surgery, tell your doctor or dentist about all the products you use (including prescription drugs, nonprescription drugs, and herbal products). Older adults may be more sensitive to the side effects of this drug, especially drowsiness. During pregnancy, this medication should be used only when clearly needed. Discuss the risks and benefits with your doctor. It is unknown if this medication passes into breast milk. However, similar drugs pass into breast milk. Consult your doctor before breast-feeding. DRUG INTERACTIONS: Drug interactions may change how your medications work or increase your risk for serious side effects. This document does not contain all possible drug interactions. Keep a list of all the products you use (including prescription/nonprescription drugs and herbal products) and share it with your doctor and pharmacist. Do not start, stop, or change the dosage of any medicines without your doctor's approval. Some products that may interact with this drug include: tricyclic antidepressants (such as amitriptyline, imipramine). Do not take any MAO inhibitors (isocarboxazid, linezolid, methylene blue, moclobemide, phenelzine, procarbazine, rasagiline, selegiline, tranylcypromine) during treatment with this medication and for two weeks before treatment. In some cases a serious (possibly fatal) drug interaction may occur. Tell your doctor or pharmacist if you are taking other products that cause drowsiness including alcohol, antihistamines (such as cetirizine, diphenhydramine), drugs for sleep or anxiety (such as alprazolam, diazepam, zolpidem), other muscle relaxants, and narcotic pain relievers (such as codeine). Check the labels on all your medicines (such as allergy or cough-and-cold products) because they may contain ingredients that cause drowsiness. Ask your pharmacist about using those products safely. OVERDOSE: If overdose is suspected, contact a poison control center or emergency room immediately. US residents can call the US National Poison Hotline at 1-800-222-1222. Canada residents can call a provincial poison control center. Symptoms of overdose may include: fast/irregular heartbeat, fainting, severe drowsiness, slurred speech, seizures, mental/mood changes (such as confusion, hallucinations).